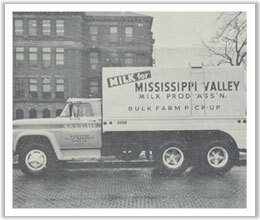 In August of 1958, two Midwest dairy cooperatives, Iowa Illinois and Quality Milk, began the process of merging together to form a brand new cooperative - Mississippi Valley Milk Producers Association (MVMPA). The new co-op set up its headquarters in Davenport, Iowa, where it is still located to this day. 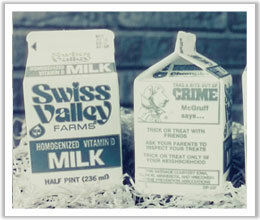 The Swiss Valley Farms brand name was first adopted for use on packaging in 1977 and the cooperative officially changed its name from MVMPA to Swiss Valley Farms in 1981. In 1962, MVMPA purchased the Buckhorn Co-op Creamery, Maquoketa, Iowa. 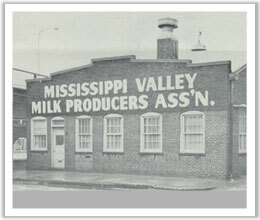 For many years, this plant served the cooperative as a butter-printing plant and later on was remodeled to be a non-fat milk, milk protein and whey drying plant. It was sold in 1997 to another Midwest cooperative, Farmland. In 1976, SVF purchased Hilldale Dairy in Dubuque, Iowa, which is in the heart of the co-op's huge dairy producer region in northeast Iowa and southwest Wisconsin. Over the years, the facility has been completely remodeled and expanded until it barely resembles the original building. In 1978, Swiss Valley Farms began bottling milk in Cedar Rapids, Iowa, in a milk bottling facility it purchased from Land O'Lakes. 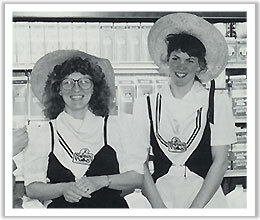 In 1987, SVF consolidated all of its milk bottling to the Dubuque, Iowa, facility and began producing cultured dairy products at its Cedar Rapids facility, such as cottage cheese, sour cream, dips and yogurt. This cultured plant was remodeled and updated in 2002. Tragically, the floods known as "Iowa's Katrina" caused severe damage to the plant and it was forced to close in 2008. In June 2009, Swiss Valley Farms sold its Dubuque bottling plant to Prairie Farms, another nationally recognized dairy cooperative. This plant is now part of a larger network of facilities and allows Swiss Valley beverage and cultured products to be positioned well for future growth in regional and national markets. With the same producers and standards in place, there will be no change in quality or service for our loyal customers. When one out of ten people in the United States bites into a piece of Swiss cheese, it's Swiss Valley Farms cheese they are eating. That's because between the co-op's Swiss cheese plant in Luana, Iowa and its Swiss plant in Shullsburg, Wis., it produces 10% of the Swiss cheese eaten in the U.S. The Luana plant is the larger of these two plants, and is one of the largest and most efficient Swiss cheese plants in the United States. Acquired in 1967 when Swiss Valley Farms merged with the Northeast Iowa Dairy Cooperative, the Luana Swiss cheese plant became one of the cooperative's flagship cheese plants. In 1971, Swiss Valley Farms renovated this plant to produce a popular specialty cheese, traditional Emmenthaler Swiss, in 100-lb blocks. Since then, the plant has been extensively expanded and remodeled. In 2001, state-of-the-art Swiss cheese making equipment was installed. The Swiss cheese made here has collected numerous awards nationally and internationally. In addition to the Swiss, some of the best cream cheese in the nation is also made at this plant, using sweet cream and other fresh ingredients. This results in the excellent cream cheese flavor and body popular with both food service customers and master bakers for its excellent blending and baking properties. This cream cheese, too, consistently wins awards in the U.S. and abroad for its excellence. 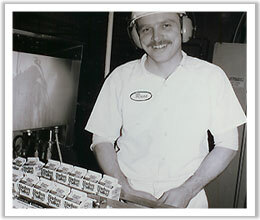 In 1997, Swiss Valley Farms acquired the Old Wisconsin Cheese plant in Platteville, Wisconsin. Here, the company made Baby Swiss wheels, loaves and no-salt-added Swiss blocks until production was transfered to White Hill Cheese Co., LLC in 2011. The Platteville facility was sold in 2012. Also in 1997, Swiss Valley Farms merged with another large Midwest dairy cooperative, Tri-State Milk Producers Association. Along with this excellent merger came a choice Blue cheese plant in Mindoro, Wisconsin. 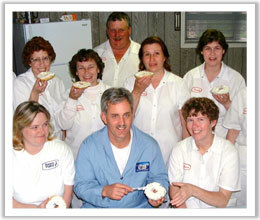 In 2001, this specialty cheese plant was expanded and remodeled, doubling its size. Wheels of Danish-style Blue cheese and Gorgonzola are produced there and sold to grocery stores and delis throughout the Midwest. In 2001, the cooperative purchased Rochester Cheese, LLC. Rochester Cheese is comprised of two locations in Minnesota. The Rocheseter site, formerly a warehouse, was renovated in 2012/2013 to to include production lines for the company's club and pasteurized process cheeses. The Spring Valley site now acts as a warehousing and contingent site. In August of 2010, Swiss Valley Farms acquired Faribault Dairy. The sale included Faribault's Blue cheese manufacturing facility and its line of branded cheeses, which are aged in the sandstone Caves of Faribault. The sale brings together the history, talent and resources of two of America's most experienced Blue cheesemakers. Also in August of 2010, Swiss Valley Farms announced a joint venture with Emmi-Roth Kase to manufacture cheese in Shullsburg, WI. The joint venture, called White Hill Cheese Co., LLC, allows both companies to respond to the growing consumer demand for Swiss cheese. On April 1, 2017, Swiss Valley Farms merged with Prairie Farms Dairy, Inc. The combined company now operates under the name of Prairie Farms Dairy, Inc., but the Swiss Valley Farms brand remains.